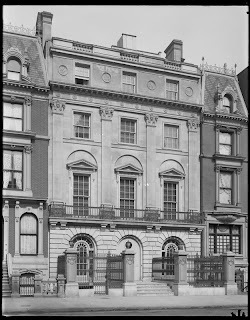 The Richard Thornton Wilson Jr. residence designed by Frances Laurens Vinton Hoppin of Hoppin, Koen & Huntington c. 1906 at 15 East 57th Street in New York City. Wilson was a banker at his father's firm of R.T. Wilson & Co and was heavily involved in thoroughbred horse racing. In 1896 he joined forces with Harry Payne Whitney, brother-in-law of his sister Grace Wilson Vanderbilt (who was married to Cornelius Vanderbilt III), to purchase the Saratoga Race Course. Wilson's older brother Marshall Orme was married to Caroline Astor, brother of J.J. Astor IV, sister Mary was married to Ogden Goelet and sister Belle was married to Sir Michael Henry Herbert. The residence has since been demolished. Photo from the Museum of the City of New York. 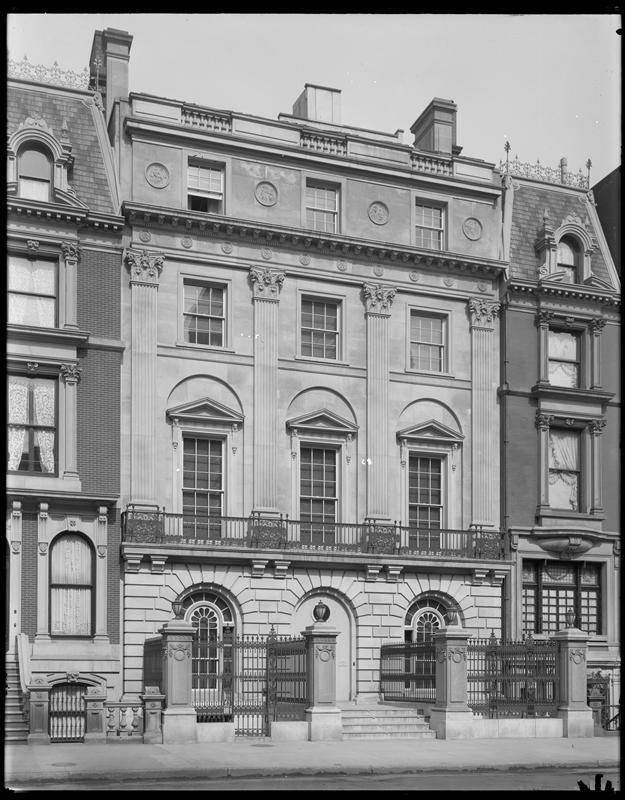 Wilson had purchased an 1870s Arthur Gilman designed residence owned by Sidney Hopkins at 15 East 57th. "Hoppin, Koen & Huntington have awarded to Patrick Gallagher, general contractor for the enlarging and remodeling of the city home of Richard T. Wilson Jr...."
Christopher Gray writes that "In 1906 the banker Richard T. Wilson Jr., bought the former Hopkins residence, which he tore down and replaced with a new English Renaissance town house of limestone." So...torn down and built anew or enlarged and remodeled? What a handsome house! I've had a few career related encounters with the Wilsons, an interesting family indeed! Indeed, a very, very handsome house.